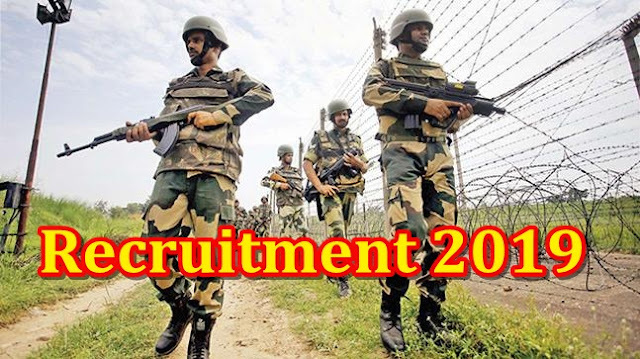 BSF recruitment 2019-20, BSF Bharti has invited applications for 1763 constables. If you are interested in this BSF recruitment 2019, then you will apply before February 23. These vacancies can be changed or extended or can be reduced to all the vacancies for all states. Educational Qualification: matriculation or 10th grade pass or equivalent from recognized board / university: - One-year certificate course from the Industrial Training Institute of the vocational institute with experience of two years in related trades or at least one year experience in the trade. Or a two-year diploma from the Industrial Training Institute in the same trade. Visit the official notification for more information. between 18 and 23 years on August 1, 2019 Due to the instructions issued by the Central Government from time to time, the discount for Scheduled Caste / Scheduled Tribes / Other Backward Classes and other Special Category candidates. The candidates who will be selected in this BSF recruitment in 2019 will be appointed throughout India. Attach all documents and send the filled application form to the address given below. The Border Security Force will issue the entry letter of the written examination. Entry will be issued 15 days before the examination. Admission Letter is a very important document to sit in the Admission Letter. Without entrance tester, the examination will not be allowed. The results of the written test of BSF will be released after the selection process is over. After logging on to the official website, you can check the results.